What happens when you blend a 7-inch Android tablet with a gaming controller? Well, you get something like the Archos GamePad – a peculiar little gadget that is already on sale in parts of Europe, reportedly selling better than its maker anticipated. With its arsenal of physical buttons, analog sticks, and 4-way d-pad, the device is aimed at gamers who miss the feeling of physical controls when playing their favorite titles. And since it runs on Android, the GamePad can be used as any other tablet for things like surfing the web or socializing online. 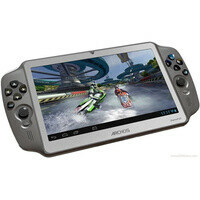 But the launch of the Archos GamePad won't be limited solely to the European market. In fact, the device is scheduled to arrive in the U.S. no later than February for a price of $169. That gets you a dual-core 1.6GHz processor, 1GB of RAM, 7-inch screen screen with a resolution of 1024 by 600 pixels, and 8GB of storage. A front-facing camera and a built-in microphone have been thrown in as well. Sure, we know that for just a little extra you can get a tablet that is much more capable, such as the Google Nexus 7, but hey, no alternative will offer you physical buttons for gaming. Anyone thinking of checking the Archos GamePad when it is out? I probably prefer to just use my note 2 as a controller and hook it through my tv HDMI port to play games and movies. But I guess that for a hand held game it sounds good. About like the price range of a Nintendo D's. The archos is more capable computer with better graphics minus 3d but I don't see the quality games like on the Ds. I still might just get the PSP vita. Or a PSP enabled gamepad. 169? wow be a nice portable system for sure not just for games but facebook the internet and other things. Imagine if Google did this. It would raise the bar in Android gaming. Have 2 models of the Nexus 7; one with controls and one without.